Nearly one in three American adults has been arrested at some point in their lives. These Criminal Records are kept on file for infractions from DUI to embezzlement, all searchable through our online database. More than 12 million arrests are made in the U.S. each year. Our searchable database of Arrest Records consists of millions of pages of information culled from 11,000 police jurisdictions and over 16,000 courts. A court officer must sign Warrants for certain arrests or evidence, and individuals named may not even know they’re wanted. Search data from over 6,000 municipal courts, 10,000 state courts and 600 federal courthouses. Marriages in the U.S. have declined since 2000, to about 2.1 million annually. Use our Marriage Records database to comb through records from courthouses and vital records offices by name, date and location. Over 800,000 couples divorce each year – a decrease from a peak of 944,000 in 2000. Using municipal court records found in our database, you may search millions of Divorce Records by name, date and location. About 1.4 million arrests were made for drug offenses in the U.S. in 2014, each resulting in several pages of Court Records. Culled from thousands of sources, our database allows you to access important information. 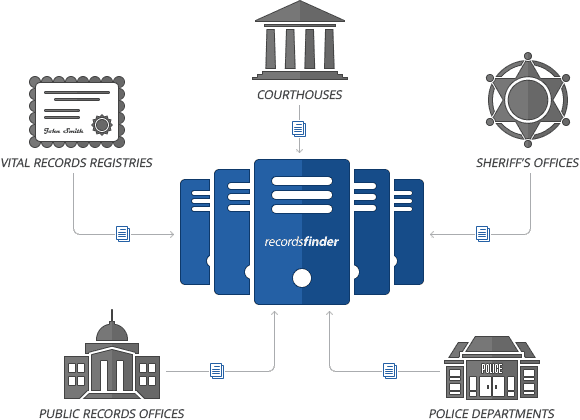 Police Records may include arrests, summonses, gun permits and other reports – now you may search thousands of law enforcement files quickly and easily, using our online databases of more than two billion records. Two billion records are available through our searchable database, all Public Records from property transactions, legal judgements, court records, vital statistics, and bankruptcy filings to driving records and more. We have one of the largest and comprehensive public records databases in the industry totaling over 2 billion records and covering 95% of U.S. adult population. Our records are collected from thousands of public and private sources nationwide. One third of American adults has an arrest record by age 23, creating millions of searchable pages of new documentation each year. One in 15 Americans has spent time in jail, and 6.5 percent has a felony record. A total of 80 million Americans have some criminal record, most of which show up in searchable databases. The population of the United States is nearly 319 million, accounting for billions of pages of searchable documents in databases we have access to.